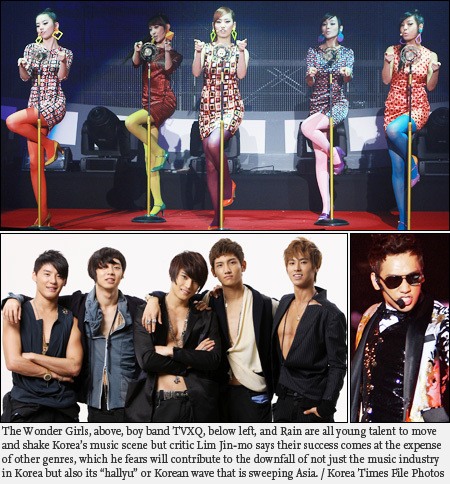 It may not be an exaggeration to say that today’s Korean pop charts are literally “occupied” by boy bands and girl groups such as the Wonder Girls and TVXQ, whose members are in their late teens and early 20s and dance to computerized hip-hop music. This trend is making it harder than ever to watch sophisticated performances by middle-aged artists on the small screen particularly during primetime hours. Lim Jin-mo, one of the country’s most influential music critics, said the unbalanced exposure of singers to the media will undermine K-pop’s international competitiveness and eventually devastate the country’s breeding ground for young musical prodigies. 1st week of November the week for the Korean singers on Oricon Chart? Members of Downtown (T/N from Japan show “Downtown no Gaki no Tsukai ya Arahende”) comedy group, an actor-director Hitoshi Matsumoto attended the press conference of “New World Culture” the 14th Pusan International Film Festival on October 10th, 4:30 pm at New World Haeundae Centum City Hall. Matsumoto Hitoshi is currently hosting a music program in Fuji TV called “Hey Hey Hey Music Champ”. He showed a deep affection to Korean singers who are advancing to Japan such as BoA, TVXQ, and SS501. “There are a lot of Korean singers who come to the music program I’m hosting in. I met with TVXQ and BoA and they left me a purely good impression. They’re sincere and having good attitude without thinking that they’re actually popular group there.” he praised highly.